John and Virginia Robertson (center) talk over the transfer of the Beverly Robertson Yeagley Memorial Scholarship to the AHS Foundation with Sarah Morris Brown '61, secretary and John Klusch '34, chairman, in this 1994 photograph. she had won the respect of her students, even though she insisted upon their working to their maximum ability. It was with heavy hearts that our faculty, students, and community received word of Beverly Robertson Yeagley’s passing away on January 22, 1966. Even though the privilege of having Beverly Yeagley with us but a short time, she will leave her footprints stamped upon the minds of her students as being one of their outstandingteachers. She will be missed by all. 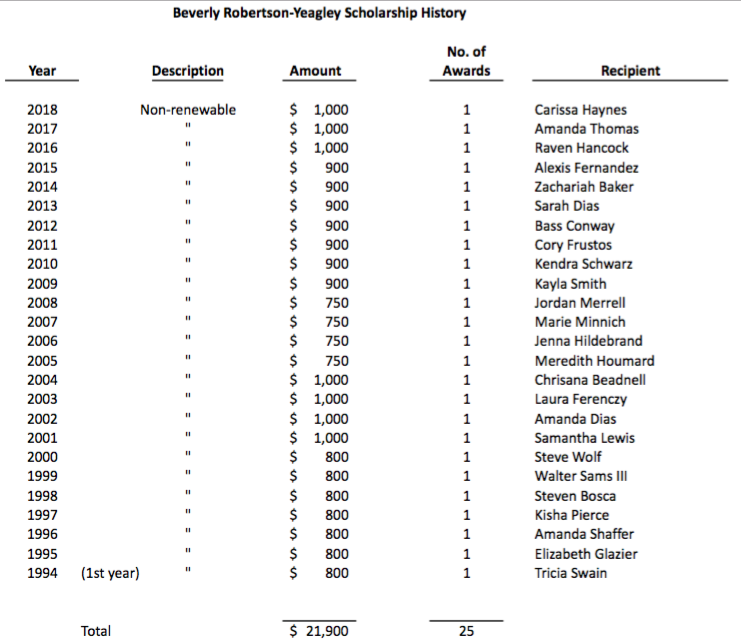 In 1994, the Beverly Robertson Yeagley Memorial Scholarship, having been established in 1966, had provided AHS graduates with more than $27,000 in scholarships. At that time, due to administrative costs and low interest rates, Beverly’s parents, John and Virginia Robertson decided to transfer their daughter’s memorial scholarship fund to the Alliance High School Foundation to take advantage of the Foundation’s ability to earn higher interest.